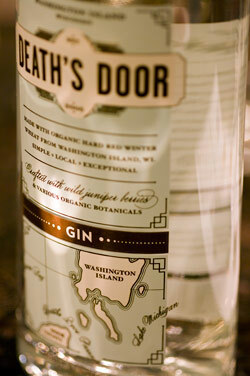 The handcrafted gin by Death’s Door Spirits won Wine & Spirits Best Spirit award in 2009, so yeah, there’s that. It may have won this award because it’s made from a special winter wheat that only grows on Washington Island, Wisconsin. This sustainably grown red wheat is harvested in a pristine maritime environment. The gin is a three botanical blend of organic juniper, coriander and fennel. The tasting experience begins with a bright juniper bouquet followed by a mild middle note of coriander and then cinched with the crisp, clean fennel finish. I swear that there’s lavender involved, but there’s no mention of that anywhere on the internet. The botanicals that are extracted in the distilling process have a bright aroma and no bitter taste what so ever. 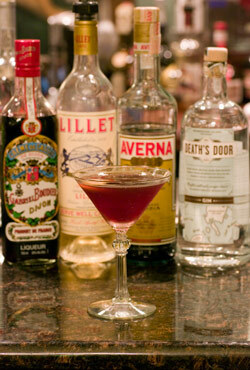 The organic ingredients jump out and are very lively in a cocktail, which can add a nice layering to your creation. Sells for around $35 a bottle. Here’s a cocktail we made using Death’s Door gin. I’m looking forward to making more recipes with this gin. If anyone has had success using Death’s Door gin please share in my comments. Stir all ingredients with ice except orange peel and strain into a chilled cocktail glass. Shake all ingredients in an iced cocktail shaker. Stain into chilled cocktail/martini glass and garnish. Thanks for the recipe, I’ll have to give it a try! I must be getting that lavender taste from your amazing juniper berries. Pour lemon juice and gin into a cocktail glass. Add one large ice cube (like from a Tovolo King tray), top with ginger ale and stir. Garnish with lemon zest. Shake gin, lemon juice and simple syrup with ice in shaker, strain into double rocks glass with ice and float blueberry liqueur. 4 fresh blueberries skewered on a toothpick for garnish. Nice keep creating and drinking! Had my first taste, from the first bottle I bought, today. I keep my gin and my vodka in the freezer, but tasted Death’s Door before it was completely chilled. Awesome. I usually drink gin as a very, very, very dry, and very chilled martini, but now I understand why some folks skip the vermouth. Also, I’m a minimalist, and a purist, but now confounded, more than ever before, about why anyone would ever mix/dilute a good distilled product with anything else, ever.